Looking to get some input on the latest UOA from Blackstone. Their comments have made me go into a bit of a panic mode even though I know there is not much I can do at this point. I've been running Amsoil since my first change at 6000kms. The first analysis was over winter. Mild driving with a few hard days. The last analysis saw 2 days of hot lapping and 4 autocross events. Am I right to panic or is it such a small number that i might be negligible? Car is completely stock. I will convert this to code when I get a chance but here is the report. I cat see the report as some images are blocked by our Co.'s Barracuda filter. High Iron and Cu? Is it under 100PPM? Don't worry. Engin erun and sound ok? Sorry, totally forgot that it might get blocked by networks. Engine runs and sounds great. I just installed an IAG Air Oil Separator to try and keep the oil out of the intercooler. I found a slight film on the pipe between turbo and intercooler. No oil consumption at all. Comment from Blackstone: "It doesn't take much silver and copper to show a bearing problem, and your level has us concerned. You mentioned this engine saw some time at the track, so that could explain a lot of this excess metal, though you'll want to be on the look out for any signs of engine distress (knocking, low oil pressure light, etc.). That is at least until wear improves for you. This engine should be well past break-in now at 25,000kms, so there really isn't any good reason for this excess wear. Try 3,000 kms on the next oil if you'll race more. 5,000 kms should be okay if not." Last edited by Nurp; 07/02/15 12:23 PM. ImO, AMSOIL is not the best choice for high performance cars, especially 5w30 and especially for STI. It is oriented on long OCIs. You need something more robust from protection point of view. I would give a try to Redline 5w30 or 5w40 or Motul 300. May be Royal Purple HPS series is not too bad. But AMSOIL would be my last choice same as Mobil1, which is good for flush purposes only. No need to switch brands. If you want to use 5W-30, use Amsoil HDD 5W-30, or better use the full SAPS Amsoil 0W-40 or 5W-40. That's what I use in my 2014 WRX. It wouldn't hurt to go up to some kind of XW-40 especially pushing the engine hard. I don't know where you get that. What????? Completely disagree. Amsoil and M1 have plenty of anti wear additives for protection, and all or part PAO. I don't think you can always blame high copper/iron/etc. on the oil. The tolerances, maybe particle contamination, etc. has a lot to do with what's going on. Granted I have seen tech papers saying the calcium overbased detergents do antagonize wear a bit, and Amsoil is certainly slightly higher in detergent than most synthetic I've seen. OK, maybe you could make a case there. Amsoil is careful not to put in too much calcium though. Last edited by ExMachina; 07/04/15 08:57 PM. If you're concerned about the silver, contact Terry Dyson. Silver _can_ be a fairly specific issue in a turbo Subie. As an aside, and while they are right about as often as coincidence and/or luck allow, Blackstone Labs' comments are useful solely for amusement. I agree with Pablo. Stick with his recommendations you'll get plenty of protection. Hmm I find it weird that some of the comments are saying Amsoil isn't the best for protection. I actually chose Amsoil specifically because I've heard nothing but good things about it. From my report it seems that it has only sheered 7% in 5000 kms with two long days of tracking. Maybe I'm just not familiar with what a "good oil" is. The car is primarily a daily driver and does not see high loads except for an autocross event once or twice a month. 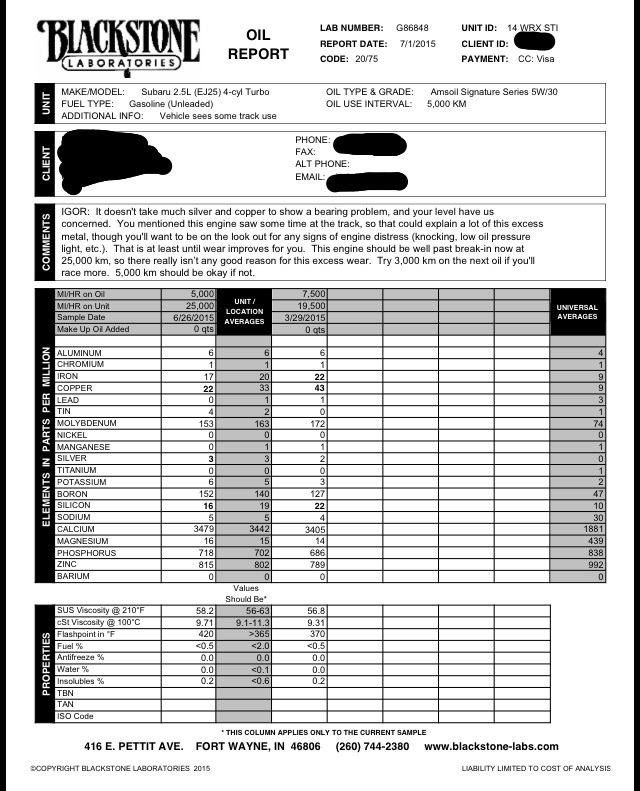 The HPDE tracking days were an exception during the last oil change. I'm going to wait until my next UOA and see how the wear is at that point and then decide whether I want to go up to a 0W-40 weight. Hopefully the copper and silver content was just an oddity due to the HPDE weekend. There have been quite a few bearing failures on late model STI's and WRX's. In some cases there were bearing failures on uoa's with silver as low as 6 ppm's which is why Blackstone is flagging this . I also agree with Pablo on the oil recommendation. Run an oil with an HTHS of 3.5 or higher, especially if you hit the track. Amsoil has many better choices, IMO. Last edited by bluesubie; 07/06/15 12:25 PM. Another +1 to Pablo's recommendations. If you are hitting the track with this vehicle at all get an appropriate oil for protection under the more demanding conditions. Would you recommend using 0W-40/5W-40 during the summer while tracking and then switching back to 5W-30 during winter months or would 0W-40 be fine to run year round. We get cold temps down to -35*C here in Winnipeg. Last edited by Nurp; 07/07/15 11:00 AM. If you go with a 40, stick to the 0w-40 or 5w-40 year round. There's no point in switching. Also, with Amsoil, generally speaking, they do tend to have some of the best cold weather numbers out there. Back in 09 terry dyson told me to stop using mobile1 in my wrx do to it was not adequate to handle fuel dilution. He recommended redline, which seemed un effected by fuel dilution I also had success with GC, rotella, and val.racing. Never tried amsoil.